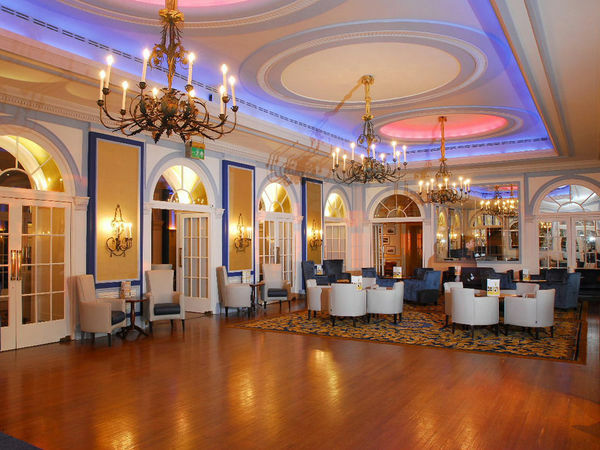 As we’ve come to Torquay to experience the Agatha Christie Festival, what more appropriate place to stay than at the Barceló Torquay Imperial Hotel. In its previous life the Barceló Torquay Imperial Hotel was the Imperial Hotel, one of the hotels with strong links to Agatha Christie. She attended many social functions here and the terrace of this hotel was the setting for the final chapter of Agatha Christie’s ‘Sleeping Murder’. The Torquay Imperial Hotel, on Park Hill Road, Torquay sits on a cliff-top overlooking Torbay. The original Torquay Imperial Hotel is from 1866. The Spanish Barceló Hotels & Resorts Group acquired the Torquay Imperial Hotel in 1997 and it’s now called the Barceló Torquay Imperial Hotel, a 4-star hotel – yes, it’s no longer a 5-star hotel as some would remember in the past. With spectacular bay views, the hotel is within walking distance from Torquay town centre. Walking back from town, there is a slight incline, although not a difficult one. The Torquay Imperial Hotel offers a gym, spa, sun beds, a sauna and a Jacuzzi. There are squash and tennis courts, and if you’re after some pampering, massages and treatments can be booked. The hotel as a whole is nothing like the resplendent place it was during Agatha Christie’s days and the place has a tired feel about it. In fact, there’s very little reference to this famous author in this hotel. If you’re looking for an Agatha Christie experience, it sadly no longer exists here. In fact, the place is very lacking in atmosphere and staff strut past you without so much as a greeting. There are 152 rooms of which 77 are Premium sea-facing bedrooms. The seafront rooms have private balconies from which you can enjoy panoramic views of Torbay. According to the concierge one of the first things most guests do when they check in to their Premium bedroom is to go out onto their balcony to admire the Torquay seafront. We didn’t book the Premium room , but our room no. 232 was smallish but very comfortable, with a modern, new and spacious bathroom. The wallpaper and paintwork were new as well and there was nothing wrong at all with the room, although many TripAdvisor reviewers have complained that the hotel is old and shabby. According to the hotel, you can enjoy Fine cuisine in the Regatta Restaurant, along with fine wines and panoramic views of Torbay. We didn’t dine here as there are many restaurants to choose from along the Torquay waterfront. The romantic link to Agatha Christie, although this link seem to no longer exist. We booked a special rate for our stay and can’t complain about the quality of the room given the price we paid. There is internet connection in the rooms but at GBP 6.50 an hour, it’s not cheap. There is WiFi in the lobby area and if you have your own computer, you can get 30 minutes free access. With the exception of the reception staff, none of the other staff seem to believe that it’s polite to acknowledge guests when walking past them. We arrived from Plymouth by train. Taxi fare from Torquay Station to the Torquay Imperial Hotel was £6.50.